this dish a great flavor. Chicken keema is a great combination of protein and vegetable. Keema is a very popular North Indian dish Keema means minced meat. It is usually cook with minced lamb meat but it can be prepared with any kind of meat and combination of vegetable. 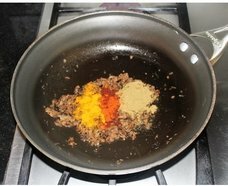 Keema is extremely versatile, just changing the combination of meat, vegetable and masala can result in a great new taste and each of them is delicious. Serve chicken keema as a main course with chapattis and rice. 3. On high heat add the oil in a nonstick frying pan or in a sauce pan, add minced onion and garlic and sauté, while periodically stirring. Onions will have a lot of water so for the first 8 to 10 minutes keep the heat high so that all the onion water evaporates quickly. 7. Add tomato puree or tomato sauce. With the tomato puree onion masala become watery turn the heat high for 2 to 3 minutes, so that water evaporates quickly, and then turn the heat down. Keep stirring the onion masala frequently. minutes or until spinach change its green color to yellowish green. 10. 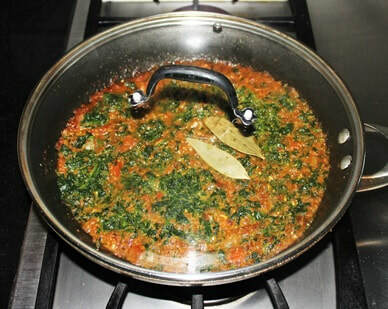 Add thawed or fresh chopped spinach, salt, bay leaves and 1cup of water, mix everything together, cover the pan and cook on medium heat for15 to 20 minutes or until spinach change its green color to yellowish green. just add minced chicken and mix. lumps of the chicken with the spatula. and mix, cover the pan and cook for another 5 to 6 minutes. ​16. 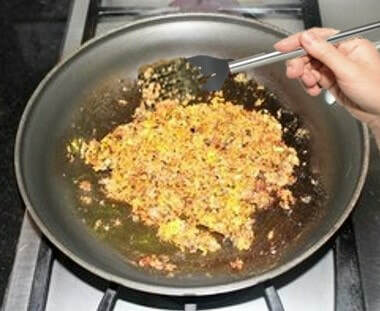 Once keema is cooked add 2 tablespoons of melted butter and cook for 5 minutes while keep stirring continuously, once you start seeing the oil in the pan turn the stove off. 17. Chicken keema should not be too watery it should have thick consistency. 18. When ready to serve remove bay leaves. Transfer the keema in a serving bowl and garnish it with chopped coriander leaves. 1. If you don't find minced chicken at the store, buy skinless, boneless chicken, wash and dry, then grind in a food processor or a chopper. 2. 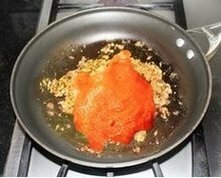 To avoid forming lumps in the chicken, add raw minced chicken in a bowl then add 1½ cups of water and mix it with spoon. 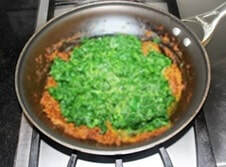 Dilute the minced chicken, and then add it in the cooked spinach and mix frequently for few minutes. 3. 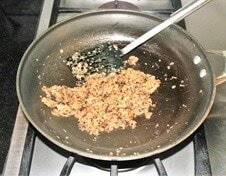 Ground turkey meat could be substituted with ground chicken. 4. Adjust the amount of spinach and ground chicken according to your preference.